In the semi-darkness, a masked, covered figure lies centre stage, surrounded by three ropes that hang from the ceiling. Sleeping or dead? The house lights go down and there’s movement from the front of house entrance as a procession of masked figures enters, each bearing a death mask mounted on a bamboo pike. Their voices rise in a wordless, melodic, wailing music that evokes the sounds of ancient mourning. A people torn apart by war. Living with unspeakable loss. And so the stage is set for the Alumnae Theatre Company’s production of Antigone (Anouilh), directed by Janet Kish. Enter the Chorus (Amanda Cordner), our narrator and guide to this world. We are in a nowhere land of here, there, then and now – out of time and place, in a parallel universe where ancient Greece meets WWII Paris. And the lighting on the three ropes gives the space a three-ringed gallows appearance – and the Chorus, dressed in tails, is the Ringmaster. In a country recovering from a civil war between Oedipus’s two sons, who once shared the throne but are now both dead at each other’s hand, Oedipus’s brother Creon (Scott Moore) is now king, a tyrant who has buried one nephew with honours and left the other’s corpse to rot in the sun and be devoured by animals. By royal decree, anyone who attempts to bury the corpse will be put to death. Creon’s niece Antigone (Kaya Bucholc) defies her uncle’s order and buries her brother, leaving Creon with a difficult choice: cover up her actions or put her to death. Antigone will do what’s right no matter what – and will do it over and over again. Creon’s response has devastating ripples – and it was all preventable. Kish has an outstanding cast for this tragic tale of right versus might. Cordner is wryly comical and sharply, at times brutally, observant as the Chorus; Marlene Dietrich meets cabaret emcee in tails, black pants, black bra and a fascinator. A laser-focused and dispassionate host, she bridges our world with that of the play. Bucholc gives a moving and compelling performance as the doomed heroine. Rough and tumble, unapologetically conscientious, brave and defiant; she seeks no permission and asks no forgiveness – but struggles with her protective feelings for her sister Ismene (Carly Telford) and lover Haemon (Christopher Oszwald), in great pain over how the consequences of her actions will hurt them. Moore gives a nicely balanced performance as Creon, Antigone’s conflicted uncle tyrant/protector who leads with a cruel pragmatism and punitive, controlling hand. The debate scene between Antigone and Creon is particularly gripping; and Creon is ultimately stung by Antigone’s assertion that he is a prisoner king – not free by virtue of the choices he refuses to make, all in fear of losing control over his kingdom. Really nice work from Oszwald as the passionate, playful and loyal Haemon; and Telford’s Ismene gives a sweet, wide-eyed quality to the favoured, entitled “good sister.” Martha Breen’s Eurydice, while largely a silent figure, is ever watchful as she knits with her blood red yarn – and her cry at the news of her son’s death would break the stones. Silent too is Christina Leonard’s page, a young boy who serves Creon well, but who registers the anxiety and oppression of a kingdom struggling to rise up from the ashes of war under an iron thumb. Great comic relief from Sara Stahmer, as Antigone and Ismene’s doting, old-school and gently scolding Nurse. And from the Guards (Eric Mrakovcic, Renee Awotwi and Patrick Fowler), salt of the earth everymen who have no use for politics, and just want to keep their well-paying jobs so they can feed their families. Mrakovcic has a nice moment of empathy with Antigone as he guards her cell; and Awotwi is hilarious as she echoes Mrakovcic’s report of Antigone’s capture and arrest to Creon. Fowler does double duty as the Messenger, dressed as a WWII pilot, who gives a heartbreaking account of Antigone’s and Haemon’s deaths in the tomb meant for Antigone’s punishment and eventual grave. This production of Antigone features powerful, evocative design, complemented by the play-themed art installation (in the lobby for the duration of the run, by set designer/scenographer Teodoro Dragonieri, assisted by scenic artist Sara Ahmadieh Rad); startling lighting design (Kelsey Laine Jacobson); and costume (Martina Christensen) and makeup (Eleanor MacVeigh) that aptly bring elements of time and place together to create this universe. The movement choreography (Jane Deluzio, in collaboration with the ensemble) and sound design/composition (Jeffrey Jones) are organic and visceral, hearkening back to the ancients while rooted in the present. A grotesquely beautiful and darkly comic tragedy, Alumnae Theatre’s production of Antigone is a work of art. Get yourselves out there to see this. 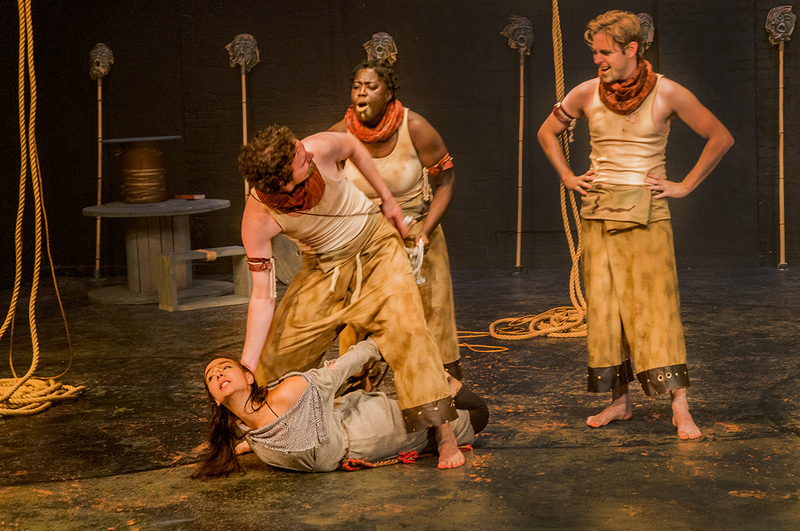 Antigone runs on the Alumnae mainstage until Oct 3; click here for details and tickets. Some special performances to note: Social Media Night (Sat, Sept 19) – texting, tweeting and messaging in the last three rows; no flash photography, please. There will be a pre-matinée panel discussion (Sun, Sept 20 – noon to 1 p.m.), Women of Courage, with six “ordinary women who have exhibited extraordinary courage in our current day and age”: Rachel Lauren Clarke, Tasvinder Gill, Tessa Hill, Andrea Patreau, Lia Valente and Meagan Tuck Yaksich. With production photos by Bruce Peters. p.s. Almost forgot to mention some minor pre-show drama when the fire alarm went off around 10-15 minutes before show time; likely set off by the fog machine. Thanks to the Alumnae peeps who ushered us outdoors and to the firefighters who arrived to ensure that all was well.